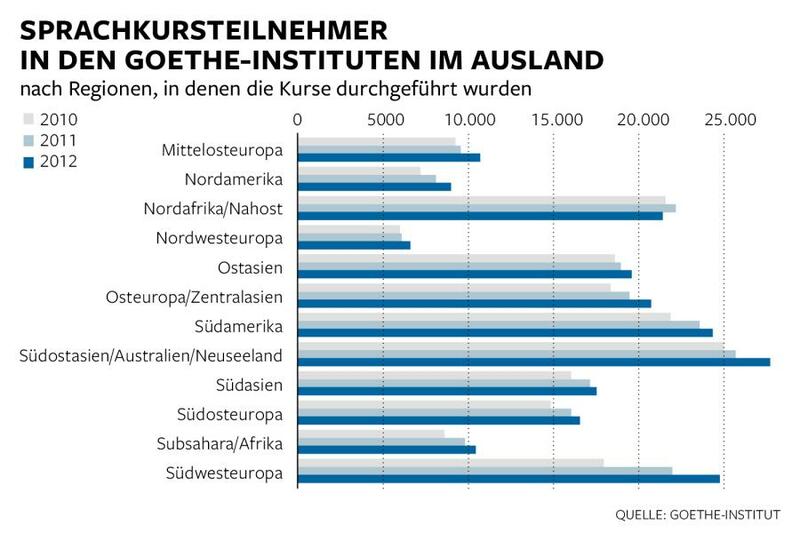 Die Welt has just released an article on the number of students enrolled in Goethe-Instituts for the years 2010, 2011 and 2012, and it comes with a chart that makes the increase in numbers very easy to visualize. The numbers show an increase each year in every part of the world except for North Africa. 2013 is almost over but not sure how long it will take to get those numbers to see the four-year trend. Southwest Europe shows the largest increase, going from what seems to be sixth place in 2010 to second place in 2012, and the areas with the smallest increase are East Asia and Northwest Europe.